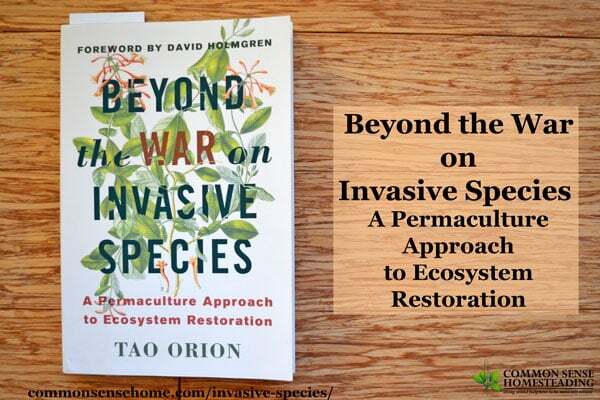 “Beyond the War on Invasive Species – A Permaculture Approach to Ecosystem Restoration” by Tao Orion is a much needed dose of common sense in an ecological “war” that may not need to exist. Too often the current approach to invasive species it to treat the symptoms instead of the disease. (Not unlike healthcare.) Tao invites the reader to look beyond the idea of “good plant versus bad plant”. Instead, we determine how each plant contributes to the ecosystem. We can then use this knowledge to encourage diverse, productive habitat. The book opens with a look at Tao’s own experience in restoring a wetland. The land being reclaimed was farmland, and after all the earth removal that went on, it was pretty raw. Native seeds were planted, but most didn’t germinate. The area became dominated by “invasive species”. In an effort to avoid the use of chemical herbicides, Tao started spot burning – and flambéed an endangered frog. On closer inspection, she found that critters were using the plants that were there. It didn’t matter to the frog that the grass he was hiding in wasn’t native. The bees and other pollinators still gathered nectar from the false dandelions. Instead of continuing the fight with chemicals and flamethrowers, the group restoring the site took a hard look at what functions the invasive plants were playing in the ecosystem. Then they planted the desired native species that would take over those functions. Results were much better. Tao also demonstrates the close knit relationships between herbicide producers and “conservation” agencies. University research is also heavily influenced by these interests, leaving little room for innovation that isn’t chemical related. There’s a lot of information on herbicide use and side effects, and none of it is good. The book continues with example after example changing ecosystems filled with invasive species. Current management strategies focus on killing the invasive species that have moved in instead of looking at why they moved in. For instance, along the Colorado River, salt cedar is now growing where once willows and cottonwood thrived. They can cut down salt cedar all day long, but it won’t bring back the willows. The river and the land around it have become too salty. I was livid with frustration over the money being wasted and the chemicals being sprayed in the name of “restoration” that wasn’t going to restore anything. Interestingly, contemporary Indians often use the word wilderness as a negative label for land that has not been taken care of by humans for a long time, for example, where dense understory shrubbery or thickets of young trees block visibility and movement. A common sentiment among California Indians is that a hands-off approach to nature has promoted feral landscapes that are inhospitable to life, “The white man sure ruined this country,” said James Rust, a Southern Sierra Miwok elder. “It’s turned back to wilderness.” California Indians believe that when humans are gone from an area long enough, they lose the practical knowledge about correct interactions, and the plants and animals retreat spiritually from the earth or hide from humans. When intimate interaction ceases, the continuity of knowledge, passed down through generations, is broken, and the land becomes, “wilderness”. Fires, intensive grazing and other methods were used in woodlands and prairies. Beaver dams slowed and distributed water, replenishing the water table. So much of what once was has been lost – but we can regain at least some of it. We can never go backward, but we can go forward with a purpose other than eradication. By combining the best of historical land management with innovative permaculture techniques, we can once again take our place as part of our ecosystem to create beautiful abundance. 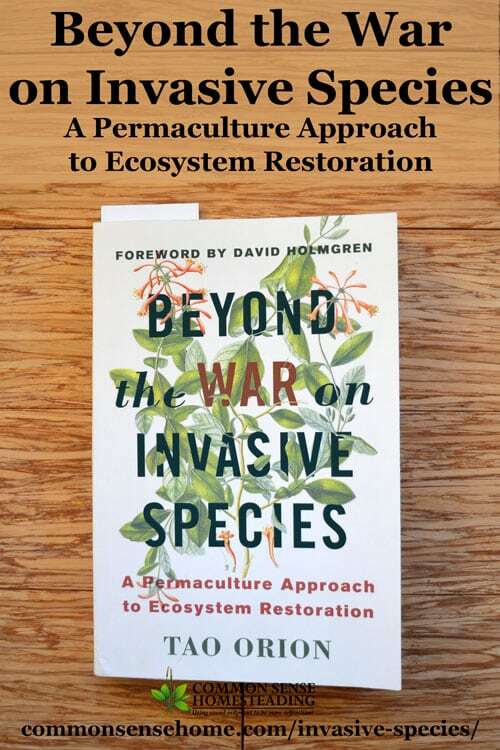 Like Mark Shephard recommends in Restoration Agriculture, we need to “stop trying to kill what wants to grow and stop trying to grow what wants to die”. I recommend this book to anyone who is concerned about the environment, as well as those who want to manage their own land more productively. Wow, only since 1958? A hundred or so years after the development of artificial fertilizer that started agriculture down this particularly destructive path. Amazing the amount of ecological damage we can do (without meaning to!) in a few decades. One of the big ideas in permaculture design is that you should gather likely species from the full global catalog to fill various niches in your designed environment, and that genetic diversity is vastly more important than planting natives. This especially makes sense in restoration work: the environment you’re starting with is nothing like whatever was there before humans got their hands on it. Also, we just don’t know what the local climate is going to look like in 50 or 100 years. Even in undisturbed areas, the native fauna may disappear for all kinds of reasons. Those hardy weeds and invasive species could easily be the only thing that prevents ecological collapse. One bit of good news is that weed seeds can survive for decades (sometimes even longer) in the soil, waiting for just the right conditions. Given the opportunity, something will grow. Just saw your review of my book and thought I’d say thanks! Glad you found it inspiring. You’re welcome, Tao. I truly enjoyed your book. Such a refreshing perspective.